SpaceX's Falcon 9 rocket lifts off on its maiden flight from Cape Canaveral Air Force Station in Florida on June 4, 2010. The successful liftoff of a new private rocket helpsvindicate President Barack Obama's plan to rely on commercial spaceships tocarry cargo and possibly astronauts to orbit, the rocket's millionaire ownersaid. 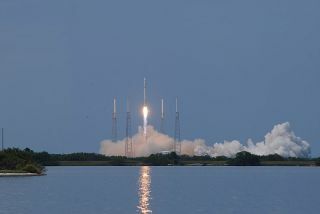 Commercial firm Space Exploration Technologies (SpaceX) blastedoff its first Falcon 9 rocket Friday from Cape Canaveral Air Force Stationin Florida. "I think this bodes very well for the Obama plan,"SpaceX founder and CEO Elon Musk said after the launch. "It really helpsvindicate the approach he's taking." It also helps prove the approach of the upstart rocket company,which aims to make space travel cheaper and more accessible to everyone, hesaid. "This has really been a fantastic day," said Musk,who earned millions by co-founding the PayPal online payment service beforestarting SpaceX. "Obviously it's been one of the best days of mylife." SpaceX has a $1.6 billion contract with NASA to use Falcon9 to carry cargo to the International Space Station after the spaceshuttles retire. President Obama has proposed cancelling NASA's existingConstellation program to design a replacement for the shuttle. Instead, hisplan depends on eventually transferring responsibility for transporting crews tothe commercial sector as well. NASA also has a $1.9 billioncontract with SpaceX rival Orbital Sciences of Virginia for space station cargoflights. "Space X's accomplishment is an important milestone inthe commercial transportation effort and puts the company a step closer toproviding cargo services to the International Space Station," NASAadministrator Charlie Bolden said in a statement after the launch. "Thislaunch of the Falcon 9 gives us even more confidence that a resupply vehiclewill be available after the space shuttle fleet is retired." Even the White House's Office of Science and TechnologyPolicy chimed in on Twitter. "Congratulations is in orderfor SpaceX," representatives wrote on the microblogging site underthe name "whitehouseostp." "In President Barack Obama's new plan for NASA, a newplayer has taken center stage ? American capitalism and entrepreneurship ? andtoday's SpaceX launch strengthens my hope that commercialspace companies will at long last remove the cost barrier that slows ourexploration of the solar system," Peter H. Diamandis, chairman of the XPRIZE Foundation, said in a statement from the Commercial Spaceflight Federation, an industry group. But not everyone was convinced that commercial spacecompanies should play such a prime role in NASA's future. "Even this modest success is more than a year behindschedule, and the project deadlines of other private space companies continueto slip as well," Sen. Kay Bailey Hutchison (R-Texas) said in astatement. "This test does not change the fact that commercial spaceprograms are not ready to close the gap in human spaceflight if the spaceshuttle is retired this year with no proven replacement capability and theConstellation program is simultaneously cancelled as the Presidentproposes." Musk took offense at her complaints. "I don?tunderstand why she's trying to hurt a Texas company," he said, pointingout that Hutchison represents Texas, and SpaceX has a large workforce in thestate. "This is an important step in the advancement of commercialspace," he maintained. SpaceX even received nods from some space legends. "As a former Apollo astronaut, I think it's safe to saythat SpaceX and the other commercial developers embody the 21st century versionof the Apollo frontier spirit," said Russell "Rusty"Schweickart, former Apollo 9 astronaut. "It's enormously gratifyingto see them succeed today." Former space shuttle astronaut Byron Lichtenberg also chimedin in a statement: "I expect that there will be a lot more astronauts inthe future because of today's success. Lower cost launches means more flights,which means more astronauts. We've only had 500 astronauts in the history ofthe Space Age, but I hope to see thousands more in the decades to come."